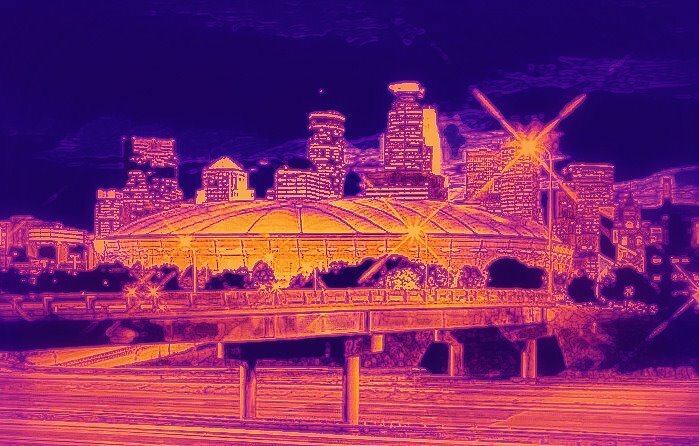 The Hubert H. Humphrey Metrodome will close its revolving, blow-you-out-the-building doors and soon be blown to smithereens after the Detroit Lions and Minnesota Vikings faceoff on Sunday. The stadium hosted many events and was the backdrop for many great sporting events, despite being fairly outdated as soon as it was open. The great sporting events held in the Dome (World Series, Super Bowl, NCAA Final Four, MLB All-Star Game, State Football, numerous memorable playoff games), I never was in attendance for. Frankly, most of those great events were before my time, but that doesn’t mean I don’t have some fond memories of the Metrodome. – The first ever professional sporting event I attended was at the Metrodome with my grandpa. I believe it was 2001, the Twins were taking on Jim Thome and the Indians. The give-away that day was a Doug Mientkiewicz shirsey and I adored that thing as a child. That shirsey is the main reason Dougy was my favorite player. I also copped out a souvenir baseball from Grandpa. It features a Twins logo and a holographic American flag flying throughout a whole section of the baseball. It still is in a case in my room. The other reason I remember this game so well is that it’s my first memories of downtown Minneapolis. I remember leaving the game early and Grandpa driving us around downtown, showing me where he used to haul mail for the U.S. Postal Service. – Every summer (for the most part), my parents and I have gone to a Twins game ever since my first appearance with my grandpa. We’ve caught one foul ball in our 13-yearish span. From the hand of Brad Radke off of the bat of Detroit Tigers catcher Ivan Rodriguez to the single-handed bare-handed grasp of my dad. I remember a couple things from that moment. One, the drunk guy behind us proclaiming that my dad had saved his life by catching that screaming liner off of Pudge’s bat. Two, we were apparently on the jumbo-tron, because my dad got a phone-call right after the catch from a kid just a couple years older than me who was also in attendance at the game. – The Twins used to annually have an ‘Autograph Party’ out on the Metrodome Plaza. For two or three years of the event a vanload would go to this event. The vanload consisting of my mother, one of my best friends Josh, his mother Jodi, his brother Kyle, his brother’s friend Sam and myself (at least that was the crew for one of the Autograph Party outings). We stood in line for hours getting autographs from current Twins and Twins alumni, all while being only a folding table across from them, which was probably the best part. – Twins games at the Metrodome were often a school field trip or incentive for us. I can’t remember if being on the school patrol was required or strongly encouraged, but everyone in third and fourth grade was enrolled in the program. The reward for school patrol was one Twins game a year and I remember that these were always the worse seats that I had ever sat in. One year, we sat in straight away centerfield. The last row of school patrol kids could touch the curtain where the murals of the retired numbers where hanging. I was in the front rows of that deck and I remember that I could not see Torii Hunter. He was back far enough, that the overhang of the deck would not let me see Spiderman. That game also featured a group of girls sitting behind me who did not know the first thing about baseball. I remember vividly the girls saying the score was triple-digits to triple-digits (320-120). The girls read the Runs/Hits/Errors column like it was a basketball scoreboard. I remember shaking my head then and I love laughing at it now. I can’t for the life of me remember who those girls were from my school and that is probably a good thing. – I attended two Minnesota Vikings games in the Metrodome, because why would you attend anymore now that we have HD-TV? I went to the first one with my dad, and the Vikings were taking on the Detroit Lions. All I remember is that the Lions were down to their third string QB to start the game, that QB (Shaun Hill??? Possibly) not knowing where he was and running out of the back of the end-zone for a safety and hearing Zac Brown Band’s ‘Chicken Fried’ for the first time ever on the ride back home. The other game I went to was through school, I think the FFA, but I could be wrong. The game featured my two favorite teams, the Vikings and the Denver Broncos. We met in the school’s shop waiting for the bus to arrive, only to find out that we weren’t going to have a bus coming. So the group of us, hoped into various vehicles and drove to Minneapolis ourselves. The vehicle I was in included some of my best buds: Isaac, Austin, and Tipper and we jammed out to Eric Church on the ride to and fro (been hooked on him ever since) and had my first ever Chipotle experience on the way home (also been hooked ever since). I can’t really pick which one of these is my favorite memory from the Metrodome. They all have a little something special in my heart. Somewhere in the boxes and boxes of pictures my mother has, I’m fairly certain there is a picture of the Twins game I brought my grandma to. It might not be a great picture, but it’s a picture of a memory. Memories last a lifetime even when lifetimes end.